RIOM: Compact PLC, I/O and Gateway platorm. LEROY AUTOMATION is a leading European designer and manufacturer of rugged EN50155-certified programmable logic controllers (PLC) and remote I/O modules for the Railway industry. The company is based in Toulouse (France), and holds both ISO9001 and IRIS (International Railway Industry Standard) certifications. - RIOM: Programmable Logic Controller with a modular I/O approach (digital and analogue I/Os, communication interfaces: Ethernet, MVB, LON, CAN…). This is a rugged, compact and self-contained “all-in-one” programmable unit. The RIOM has successfully been deployed on-board trains on a number of international projects by major rolling stock manufacturers. 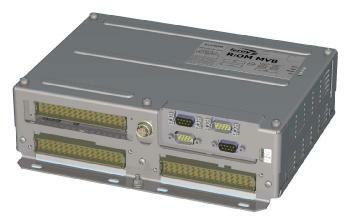 - BRIO: Remote I/O module adaptable to any type of Ethernet-based train networks. Size-6U, thin and light-weight product optimized for decentralized I/O control and monitoring functions. This platform is ideal for locomotives, high-speed/regional/intercity trains and metro cars. It has successfully been deployed on-board tramway and automated metro projects. LEROY AUTOMATION has also some strong experience with safety developments based on “SIL-2” hardware and “SSIL-2” software designs. Join in and write your own page! It's easy to do. How? Simply click here to return to PLC Directory.